I am back in New York and am very happy to have come back to a green Brooklyn! I am missing Culpeper, VA and Ground Rush Farm! I already have a new project lined up and am waiting to hear back from a few audition tape submissions! This is a workshop of a new musical called Ancient Future and two Sarah Lawrence College alums made it! Thanks Storm and Marisa! Rehearsals start Monday! I am also diving back into catering and substitute teaching (much to my dismay!) and have a few goals for myself! - Save some SAG money? Called Ingber & Associates yesterday to let them know I was back in town. So, hopefully they send me out! Also: NIGHT WITCHES PERFORMS IN NYC TONIGHT AND TOMORROW NIGHT and I am very excited to share it with some folks up here. 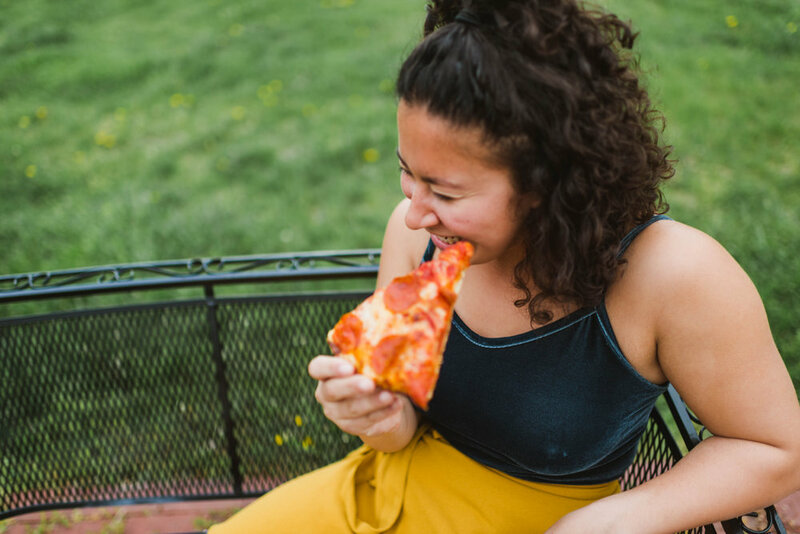 AND HERE ARE SOME PHOTOS OF ME EATING/LOVING PIZZA BY THE LOVELY STEPH DEE! Check out her website, here! I've been having the time of my life- really.